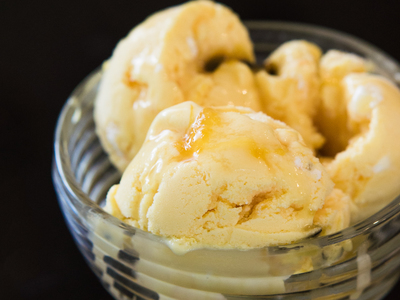 I love passionfruit any time of the year and it is my favourite flavoured ice cream! 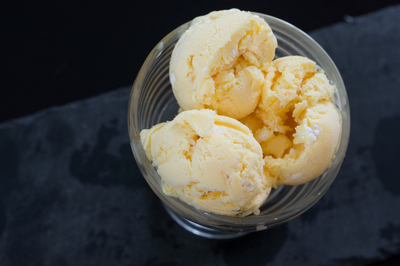 This homemade passionfruit ice cream recipe is so creamy and satisfying. Filled with crushed meringue and extra pulp, it is the perfect treat for after dinner. This recipe requires an ice cream machine but it is well worth the investment! Place milk and cream in a large pot over medium-high heat and add the lemon peel. Bring to the boil. Pour in to jug to cool. In a separate bowl, beat together the eggs and sugar until thick and pale. Pour the milk mixture slowly in to egg mixture while continuing to beat. When all combined, pour the mixture back in to a pot and place over a low heat. 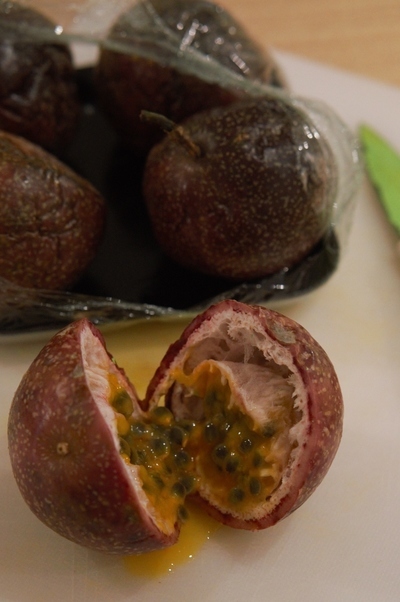 Add the passionfruit pulp and stir continuously. Don’t let the mixture boil. Stir gently for 20 minutes until mixture thickens slightly to the point where you can run your finger through it on the spatula and it leaves a line. Remove the pot from heat and strain the custard in to a bowl. Chill in the fridge or freezer until completely cold. Churn in the ice cream maker until frozen and then pour in to freezable container. Fold through crushed meringue and extra passionfruit pulp if you love it like I do. Wrap container in glad wrap and put the lid on tightly. Store in the freezer until ready to serve.